I have some questions for all the chess coaches out there. Do you ever play games against your students? Do you think it is ever worth playing a bad move on purpose against them, to give them a learning opportunity or a chance to win? Do you think it is appropriate to coach them during the game, or should you keep your lips zipped? Here’s a game I played against one of my students in chess club this week. However, it has to be said that I helped her a lot to find the right moves. Also I played a deliberately bad move at one point. Originally it was not my intention to play it, but we started talking about it and then I wanted to see if she could take advantage of the mistake. So in many ways it was not a “real game.” Does it still have any learning value? I will put /C/ next to the moves where Emmy was coached (i.e., the move was not her first choice). I think that the Exchange Variation is a good practical choice for a beginner who has never (or seldom) faced the French before. Position after 11. … Nh7. White to move. So far I think that Emmy has done an absolutely fantastic job. She has adhered perfectly to opening principles, getting all of her pieces out and moving each of her pieces once (at least until her bishop was chased). In fact, I’m the one who has not adhered to opening principles. 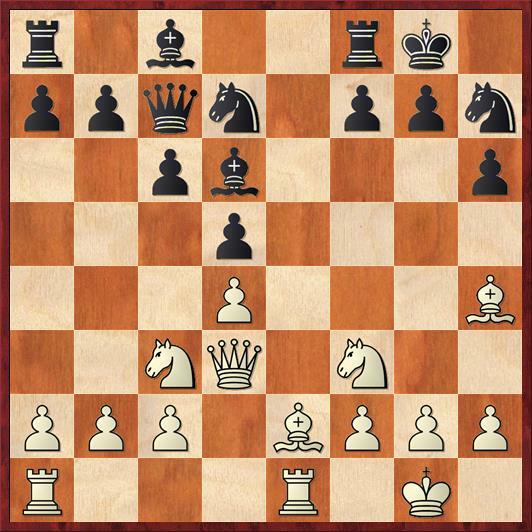 I couldn’t move my knight from d7 without allowing her to double my f-pawns, so I played … Nh7, violating lots of principles – moving my knight twice, moving it away from the center. I still think Black is fine but White would be justified in playing for an advantage. Emmy wanted to play 12. Ne5 but it just loses a pawn. The game would have been a lot less interesting if she had played this move. On the other hand, maybe I should have let her do it, because she needs to learn to do blunder checks. Anyway, I explained to her that her instinct was absolutely right – e5 would be a lovely place for her knight – but she needs to prepare it by fighting for the e5 square. She came up with the candidate moves Bg3, Bd1, Bf1, and Qe3 and eventually selected 12. Bf1 herself. I was very pleased with this. She didn’t seem to know what to do here, so I asked her, “What is Black’s threat?” She correctly identified the Noah’s ark trap, … g5 followed by … f4. She had a very hard time finding a defense, and in fact she told me there was no defense, because 13. Bg3 is met by 13. … f4 immediately. But I told her to keep looking, and she eventually found 13. Be7 herself. I think that this move was cognitively challenging for her because it is defense-by-attack. I will have to reinforce that idea in later lessons. She wanted to retreat with 15. Re2 or R7e1. Again, after seeing the threat she could only think of defense-by-retreat, not defense-by-attack. On the other hand, she is a big fan of batteries, so after I asked her, “How can you set up a battery?” she got it right away. Position after 16. R1e6. Black to move. My intention had been to just talk about 15. … g5?? and then play 15. … Ndf6. But I wasn’t sure that Emmy and the other kids really grasped yet what the rooks could do if they both invaded the Black position. So we ended up playing this “hypothetical” variation out to its conclusion, and never went back to the move I wanted to play, 15. … Ndf6. This was a good move played for a bad reason. Emmy’s eyes were looking only at the queenside, not at the kingside at all. Still, because this was a good move, I didn’t try to talk her out of it. At this point, though, I told Emmy that she needed to look at the kingside, because that was where her attack was. Still she couldn’t figure out what to do, and she was looking at some really crazy stuff like 18. Nxg5. But I kept repeating the mantra, “Checks and captures. Checks and captures.” And eventually she spotted this move. This morning I started wondering, “What is the origin of the expression ‘blind pigs’?” As usual for all chess history questions, Edward Winter has some very interesting things to say about it. He seems to point to David Janowski as the source. But it’s not completely clear why Janowski called them that. What I didn’t realize is that many writers refer specifically to the “Blind Pig Checkmate” or Blind Swine Checkmate, which is threatened here with 20. Rxh7+ and 21. Reg7 mate. I can’t wait to tell the kids about this, because they love crazy names like the Fried Liver Attack. And it’s a good pattern to know. Finally… too little, too late. The coup de grace! Again, Emmy did not find this completely by herself. I pointed out to her that my king is in a stalemate position, so if she could just play a check, it would be checkmate. 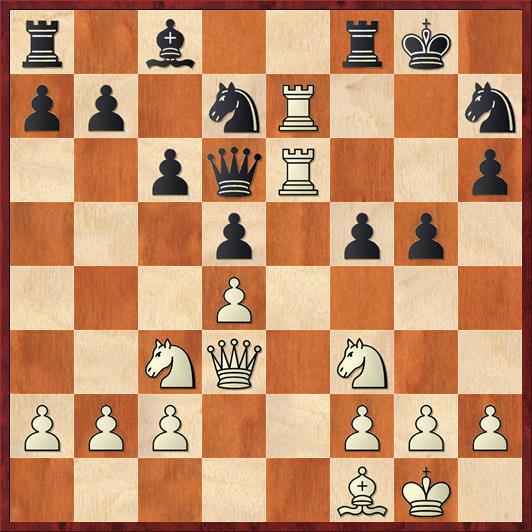 She started with some crazy ideas, but then at one point she said, “If I could just play a knight check…” I picked up on that and said, “Well, can you?” After trying Ng5 and Nh4, she finally saw Ne5 and that was that. Well, I didn’t really resign because it wasn’t a real game, and hadn’t been since move 15 (arguably since move 12). But I did congratulate her on finding the checkmate. So… Was this a good lesson, or just a fantasy game in which I meddled unacceptably and called all of the shots for her? Will such a game improve her confidence or destroy it? And do you have any theories or stories about blind pigs? All opinions welcome. 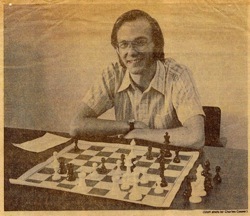 Many of my lessons become quasi-games, usually out of positions from master games, or student games. I frequently play inferior moves to make a point. I occasionally make a bad move, because I reply as fast as I can. I sometimes give weaker students a quota of takebacks to use as necessary. However, I also sometimes play “no mercy” blitz at the end of class, just to show who is the boss. it is not playing a game, it’s sort of analysis together. I frequently go over master games with my son, and he has to guess each and every move of the winner, and we discuss his choices. However, when I play him, I never advise him. I don’t play full strength (unless I give him odds), but rather try to provoke him into correct strategic and even tactic decisions. But he makes his moves 100%. Then, there’s time for a post-mortem (which is the most important thing), where of course I point him where he should’ve made a better choice, but still he should try to find this better choice himself.